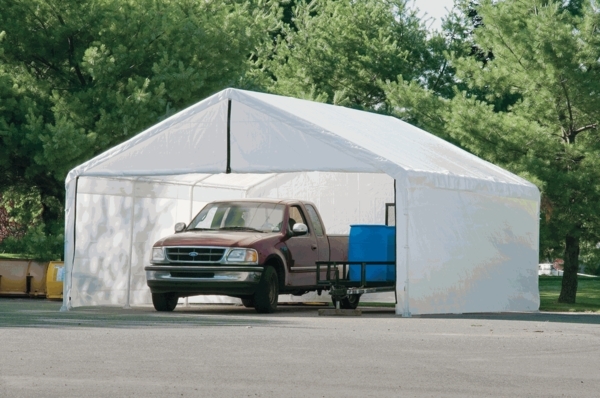 Turn your Shelter Logic Canopy into a full-blown shelter with this Enclosure Kit for your 18' x 20' Canopy. The kit includes two side walls, a solid rear panel, and a double-zippered front door panel. Each item attaches easily to your Shelter Logic canopy, and is made of triple-layered, UV treated, waterproof polyethylene fabric. It's perfect for use as a portable garage or makeshift shed. A 1 year warranty is included with thisEnclosure Kit from Shelter Logic. What is the opening height in the center of this canopy? What is the door opening height when you use the side kit on this Shelterlogic18 x 20 model? The door opening is approximately 16' wide x 6' height. Is this a complete package, including frame? No, This is an enclosure kit. You can find the Shelter Logic 18 x 20 Super Max Commercial Grade 8 Leg Canopy Shelter here.